Impulsive sound data from 2015 are available for a limited number of countries and sound sources. The predominant sources are: seismic survey activity in the northern North Sea and eastern Atlantic; explosions and pile driving in the Southern North Sea; and naval sonar activity in the Celtic Seas and western English Channel. The amount of these activities varies substantially within these regions. PLEASE NOTE: THIS PAGE WAS UPDATED ON 31/01/2018 TO CORRECT PREVIOUSLY INCORRECT DATA FOR THE TOTAL NUMBER OF PULSE BLOCK DAYS AND CORRESPONDING CATEGORIES (PREVIOUSLY 227 DAYS, CORRECTED TO 146 DAYS). AS A RESULT, TABLE A AND FIGURES D, E, F, G, H, I AND J HAVE ALSO BEEN UPDATED. OSPAR endeavours to keep the introduction of energy, including underwater noise, at levels that do not adversely affect the marine environment. Sound is a by-product of human activities in the marine environment (e.g. shipping or construction) or is produced intentionally for the purposes of surveying the seabed or water column. Sound is referred to here as ‘noise’ only when it has the potential to cause negative impacts on marine life. The introduction of anthropogenic sound became widespread with the advent of motorised shipping, and now has a wide range of sources. Anthropogenic sound sources are categorised as impulsive or continuous. This assessment addresses impulsive sound sources, which include percussive pile driving for inshore and offshore construction (Figure 1), seismic surveys (using airguns) to inspect subsea oil and gas deposits, explosions, and some sonar sources. Impulsive sound sources have been observed to cause temporary displacement of small cetaceans (e.g. harbour porpoise), increased physiological stress in some fish species (e.g. European seabass), and developmental abnormalities in invertebrate larvae. While effects on individual animals have been shown for a number of species, there is uncertainty over whether and how the effects of sound on individuals are translated to the population or ecosystem scale. The purpose of this assessment is to assess the amount and distribution of impulsive sound sources across the OSPAR Maritime Area. This is the first such assessment of anthropogenic pressure from impulsive sound for the OSPAR Maritime Area, and these data will enable future assessment of the risk of impact to marine life. Human activities introduce many types of energy into the marine environment including sound, light and other electromagnetic fields, heat and radioactive energy. Of these, the most widespread and pervasive is underwater sound. It is likely that the amount of underwater sound has been increasing since the advent of steam driven ships although there have been very few studies to quantify any such increase in the OSPAR Maritime Area. Anthropogenic sound is commonly known as noise, but for the purposes of this assessment the term ‘noise’ is used only in relation to sound that has the potential to cause negative impacts on marine life. The term ‘sound’ is used to refer to the acoustic energy radiated from a vibrating object, with no particular reference to its function or potential effect. ‘Sounds’ include both meaningful signals and ‘noise’ which may have either no particular impact or may have a range of adverse effects. The term ‘noise’ is only used where adverse effects are specifically described, or when referring to specific technical distinctions such as ‘masking noise’ and ‘ambient noise’. (Van der Graaf et al., 2012). Sound sources can be categorised as continuous or impulsive. Impulsive sounds are of short duration and with a rapid onset (e.g. explosions, pile driving, seismic airguns, sonar), while continuous sounds are long lasting and do not have pulse characteristics (e.g. shipping, dredging). Impulsive sounds may be repeated at intervals (e.g. pile driving), and at distance will become diffused and may have a more continuous nature. High frequency sounds propagate less well in the marine environment than low frequency sounds, which can travel far in waters that are sufficiently deep. Marine organisms that are exposed to anthropogenic sound (e.g. harbour porpoise Phocoena phocoena, see figure a; and European seabass, Dicentrarchus labrax; see figure b) can be adversely affected over short timescales (acute effect) and over longer periods. Adverse effects may be subtle (e.g. temporary reduction in hearing sensitivity, physiological stress) or obvious (e.g. overt behavioural responses, death). While there is a growing body of literature on the potential effects of anthropogenic sound on individual animals (Williams et al., 2015), obtaining direct observations of the effects of anthropogenic sound on particular ecosystems or populations is challenging. As such, there is uncertainty over whether and how effects on individuals are translated to the population or ecosystem scale. Descriptor 11 of the EU Marine Strategy Framework Directive (2008/56/EC) contains two Indicators of Good Environmental Status (GES) in European waters: Indicator 11.1.1 on “low- and mid-frequency impulsive sounds” and Indicator 11.2.1 on “continuous low frequency sound”. At present, there are no quantitative targets for GES, and the two indicators serve as surveillance indicators of anthropogenic pressure. OSPAR has adopted indicator 11.1.1 as an OSPAR indicator, which is the subject of this assessment. This is a pressure indicator based on the spatio-temporal distribution of low-frequency and mid-frequency impulsive sound sources within the OSPAR Maritime Area. Data were obtained from the Impulsive Noise Registry (INR), which was developed for OSPAR by ICES, in 2016, to hold data on impulsive sound activities. The registry accords with the guidelines from the EU Technical Group on Underwater Noise (adopted by OSPAR in 2014; OSPAR Agreement 2014-08), and is maintained by ICES. Initially, this registry was supported by OSPAR alone, but is now also used by HELCOM and may be used by other Regional Seas Conventions in the future. Data have been uploaded for several countries and this process is expected to continue. The database collates the data in a standard format and in accordance with the data requirements for the OSPAR Impulsive Noise Indicator (OSPAR, 2014). This assessment uses data from 2015 (see Table a for the countries reporting for this period are a summary of the data types). Data submitted after the reporting deadline (e.g. data on explosions from Sweden) were too late to be included in the present assessment. Table a: Inventory of 2015 data included in the assessment. In other words, the Indicator records the number of days within a specified spatial unit in which anthropogenic impulsive sound occurred in a given calendar year. Only sound sources above a specified intensity level are included. These levels are detailed in the technical specification of the Impulsive Noise Indicator (OSPAR, 2014). The spatio-temporal unit used in the assessment is termed Pulse Block Day. 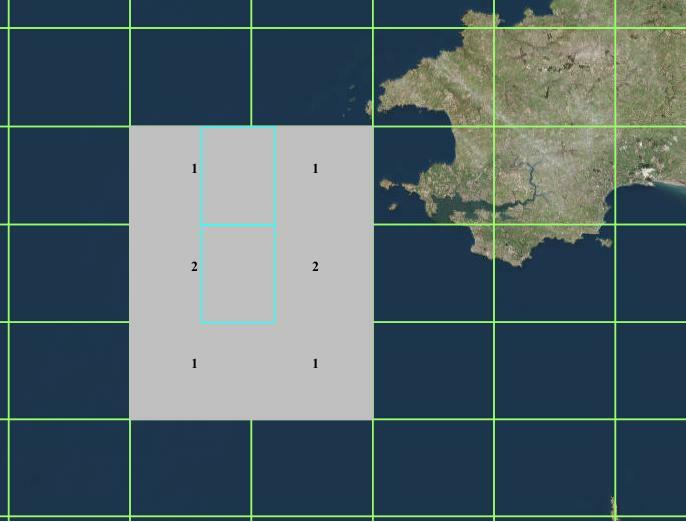 The spatial component of the Pulse Block Day is the ICES statistical sub-rectangle (hereafter ICES sub-block), which is defined in a standard way throughout the OSPAR Maritime Area, and provides detailed resolution at the regional scale. In addition to Pulse Block Days of activity as defined in the OSPAR Impulsive Noise Indicator, this assessment provides visualisations of the intensity of the activities recorded in the Impulsive Noise Registry. The intensity of impulsive sound sources was categorised according to intensity levels defined in the OSPAR Impulsive Noise Indicator specification (OSPAR, 2014) for explosions, seismic airgun arrays, pile driving, sonar, and acoustic deterrent devices. Contracting Parties have the option of reporting in terms of these categories (Very Low / Low / Medium / High / Very High) can be optionally reported by Contracting Parties, although these data may not be available in all cases (i.e. naval sonar). The use of source mitigation measures (e.g. bubble curtains) can also be reported to the Impulsive Noise Registry. Figure c: Pulse block days (grey boxes with number of pulse block days within) attributed to one day of sonar activity recorded in two UK licensing blocks (blue rectangles). The green grid represents ICES statistical sub-rectangles; the spatial unit for pulse block days in this assessment. Slight overlap between the UK licensing blocks and the ICES statistical sub-rectangles amplifies the apparent spatial scale of activity, resulting in a conservative assessment. Although the intensity of sources was identified as important additional information for the OSPAR Impulsive Noise Indicator, this information is only available for some sound-generating activities. There may be reasons why actual source levels cannot be made available, for example reasons of national security (such as concerning operational naval sonars), in which case the source level is either not specified or only an indication of category is available. The decision as to whether source level (or an indication thereof) is made available is at the discretion of individual countries. Data for 2015 were provided by Belgium, Denmark, Germany, the Netherlands, Sweden and the UK for four sound sources (seismic surveys, pile driving, explosions, and sonar and acoustic deterrents). The distribution of these impulsive sound sources is assessed in pulse block days, defined as the number of days in a calendar year in which impulsive sound activity occurred within a particular area (ICES statistical sub-rectangle). Figure 2 illustrates the distribution of total pulse block days during 2015, based on the currently available data in the OSPAR Impulsive Noise Registry. This visualisation represents a partial assessment, since data were not available for all activities and Contracting Parties in this initial year of assessment. Impulsive sound sources were reported across the northern North Sea, to the Skagerrak, in the deep waters to the west of Scotland and to the south-west of England. Reported activity was sparser in the southern North Sea and Celtic Seas. In the northern North Sea there were areas where seismic surveys occurred on up to 146 days in 2015. In the southern North Sea explosions and piling for wind farms were more prevalent. Sonar was the predominant source type reported for the western English Channel. Figure 2: Total pulse block days reported for 2015. In addition to recording the occurrence of specific types of sound generating activity, information on the intensity of the impulsive sources is also recorded where this information is available. Five intensity categories describe the relative intensity of sound sources (ranging from Very Low to Very High). This terminology relates to source intensity and not necessarily to impact. However all sources reported are above a specified intensity level considered to have the potential to impact marine organisms (including the Very Low category). Figure 3 shows the proportion of activity corresponding to each intensity category for the Greater North Sea. 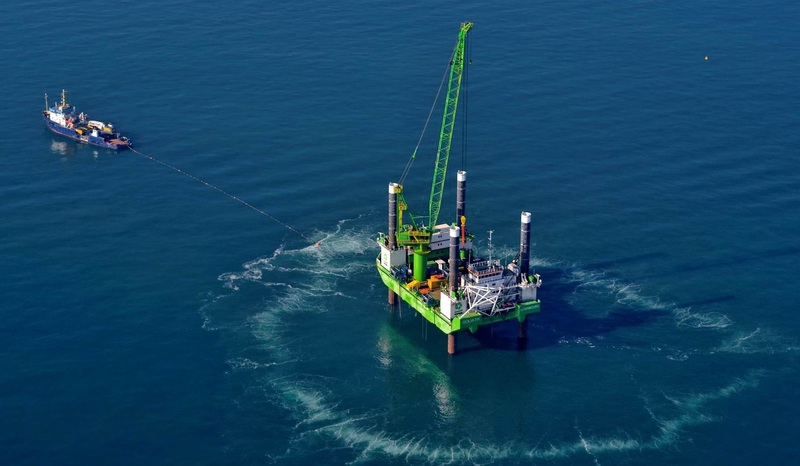 There was only one occurrence of a Very High category sound source in the OSPAR Maritime Area – an explosion in the southern North Sea. However for 293 (29%) of occurrences no intensity information was provided. The use of standardised blocks (ICES statistical sub-rectangles) and information on the intensity of sources together enables an overview of where most reported impulsive sound occurred. It also allows the application of source mitigation measures to be included. Fluctuations in sound generating activity are anticipated from year to year. This initial assessment presents partial data for 2015, and it is expected that a more comprehensive dataset will be available for future assessments. There is moderate confidence in the methodology used and low confidence in the data availability. Figure 3: Pulse block days per source category for the Greater North Sea in 2015. The source categories describe the relative intensity of sound sources. Figures d-i indicate the distribution and number of pulse block days for each source intensity category by ICES sub-block. Activities with Low and Very Low source categories (Figure d and Figure e) covered larger and more contiguous areas than those categorised as Medium to Very High, which were sparser and more concentrated (Figures f-h). Some data were not reported with an associated intensity category (Figure i): the activity shown in the Celtic Seas was naval sonar activity, for which source intensity categories were not available, while the remainder of the UK data were licensed geophysical survey activity, with intensity data reported on a voluntary basis by applicants. Figure j outlines the different activity type of pulse block days reported for 2015 (i.e. air gun arrays, explosions, impact pile drivers and sonar or acoustic deterrents). Reported activity was sparser in the Southern North Sea and Celtic Seas. In the Northern North Sea seismic surveys (using airguns) were prevalent, while in the southern North Sea explosions and piling for wind farms were the main activities. In the Western English Channel sonar was the predominant source type reported. There is a moderate confidence in the methodology used. The methodology is based on the pulse block days as outlined in EU guidance for impulsive noise monitoring (OSPAR, 2014). Further work is needed to refine this methodology to translate the activity data, outlined in polygons, into the common pulse blocks days format. There is low confidence in the data availability for this impulsive noise assessment As this is a new indicator, 2015 was the first year of data submission. As a result, data were only reported by some countries, for one year and for a selection of the possible sources. Data availability for future years will improve with continued annual reporting. Figure d: Pulse block days reported in 2015 with source category Very Low. Figure e: Pulse block days reported in 2015 with source category Low. Figure f: Pulse block days reported in 2015 with source category Medium. Figure g: Pulse block days reported in 2015 with source category High. Figure h: Pulse block days reported in 2015 with source category Very High. This first assessment of the OSPAR Impulsive Noise Indicator shows the distribution and intensity of reported activity in the OSPAR Maritime Area in 2015. 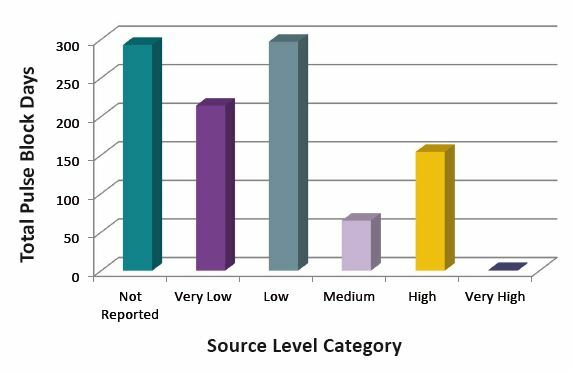 The assessment provides the first detailed information on the distribution of reported impulsive sound sources at the regional scale. Reported activity was more prevalent in the northern and eastern North Sea, to the west of Scotland and in the Skagerrak, and was largely due to seismic survey activity. Sound sources categorised as Low or Very Low intensity were more common than higher intensity sources. This distribution is likely to vary year by year, depending upon the activities undertaken. More comprehensive reporting in future years should result in improved assessments of pressure from impulsive sound generation in the OSPAR Maritime Area. This assessment highlights the locations where marine animals, if present, may have been affected (in 2015), although the occurrence of effects would also depend on the distribution and susceptibility of the marine organisms to sound exposure. The likelihood and consequences of the effects of impulsive sounds are not assessed. However, work to develop further indicators to assess the risk of impact from these sources is planned. This assessment uses the Impulsive Noise Registry to assess the OSPAR Impulsive Noise Indicator, using data available from the first year of reporting (2015). Only partial data were provided by each of the contributing Contracting Parties (Belgium, Denmark, Germany, the Netherlands, Sweden and the UK), so the assessment cannot be considered comprehensive. The pressure from seismic surveys covers large contiguous areas of pulse blocks in the Northern and Eastern North Sea and the North-eastern Atlantic, while pressure from explosions and pile driving activity was scattered throughout the Southern North Sea. The only naval sonar activity reported was in the Western English Channel and Southern Celtic Seas. More complete reporting in future years should enable a more comprehensive assessment of activity, which will inform Contracting Parties of activity levels at a regional scale. This will include spatio-temporal trends in the distribution and intensity of activity. This assessment is pressure-based and describes the distribution of impulsive sound sources in the OSPAR Maritime Area. The use of pulse block days provides a link between the activity reported in the Impulsive Noise Registry and the maps produced for this assessment, and the inclusion of intensity categories provides further detail of the relative pressure exerted by each activity. The assessment highlights the locations of sources around which marine animals could potentially have been affected (in 2015), although the occurrence of effects will also depend on the distribution of marine organisms and their susceptibility to sound exposure. The likelihood and consequences of effects on marine organisms arising from exposure to impulsive sounds are not assessed in this assessment. Work to develop further Indicators to assess the risk of impact from these sound sources on marine species is planned. To ensure consistency across source types the definitions of the source intensity categories should be reconsidered, including how to include a reduction in source intensity from source mitigation technologies. Improved reporting in the future will also allow the assessment of cumulative effects. Understanding of the effects of anthropogenic sound on particular species has advanced in recent years. Nevertheless, obtaining direct observations of the effects of anthropogenic sound on ecosystems or particular populations is challenging. As such, there is uncertainty as to whether and how these effects of sound on individuals are translated to the population or ecosystem scale. Issues have been identified with the conversion of polygon data provided by Contracting Parties into ICES sub-blocks, which are the standardised spatial unit used for this assessment (see also Assessment Method). For example, in the UK, seismic surveys are licensed in licensing blocks which do not correspond to ICES statistical sub-rectangles, resulting in a substantial over-estimation of the pulse block area (see Figure c). Similarly, naval (i.e. sonar) data are provided as polygon areas, rather than discrete points. The current data conversion protocol is to consider any overlap in polygons to apply to the whole pulse block, which results in considerable over-estimation in some cases. Applying a threshold for overlap in the conversion of polygons to pulse blocks could make this conversion more accurate. A further issue is the definition of the source intensity categories used to classify the relative pressure exerted by different sources. The source level categories currently used are based on the advice of the EU Technical Group on Underwater Noise (Dekeling et al., 2014), and should be further developed to improve the categorisation across source type. A further limitation is that the effect of source mitigation measures (such as bubble curtains deployed to reduce sound output from pile driving activities) cannot readily be applied to the categories as they are currently defined. This limits the accuracy of the data reported in the OSPAR Impulsive Noise Registry, but could be addressed by redefining all source type categories according to sound source level. The scope of this assessment is to assess human pressure on the marine environment from impulsive sound sources. However, it is recognised that future OSPAR work will seek to address the risk of impact from impulsive sound sources on marine organisms. Some of the broader challenges facing this work are outlined below. The objective of the North East Atlantic Environment Strategy (OSPAR Agreement 2010‑03) is to aim to keep the introduction of energy, including underwater noise, at levels that do not adversely affect the marine environment. However, there is a lack of direct evidence on the effects of anthropogenic sound at the population and ecosystem scale, which confounds target setting (Cefas, 2015). Nevertheless, due to the growing number of studies documenting the effects of anthropogenic sound on individual marine species the potential for large-scale effects should be considered (NRC, 2005), in line with the precautionary principle. The direct observation of population and ecosystem-scale effects will require detailed long-term studies which are able to distinguish the effects of anthropogenic sound from the effects of other anthropogenic stressors or natural factors. In the meantime, studies which examine the effects of anthropogenic sound on, for example, aspects of ecosystem functioning (nutrient cycling; Solan et al., 2016) or food web dynamics (predator-prey interactions; Simpson et al., 2016) can investigate the mechanisms by which anthropogenic sound may affect marine ecosystems. A further knowledge gap is that many of the individual-based studies of the effects of anthropogenic sound have been carried out under laboratory conditions. Further studies of in situ responses to impulsive sound are needed (e.g. DeRuiter et al., 2013; Debusschere et al., 2015), particularly for fish and marine invertebrates, as well as studies on the applicability of laboratory studies to wild populations. Some studies (e.g. DeRuiter et al., 2013; Pirotta et al., 2015b) have shown that sound level can be a poor predictor of behavioural responses, and that other parameters (such as distance to source) may be more relevant. This issue is important for the prediction of impact, since an understanding of the mechanisms leading to disturbance is needed to make valid forecasts (i.e. when deriving dose-response relationships). Studies to further investigate the mechanisms behind behavioural responses are needed to clarify the roles of such parameters (Ellison et al., 2012). In addition to the pressure-based OSPAR Impulsive Noise Indicator, OSPAR aims to investigate the development of further indicators that assess the potential impact of impulsive noise. There are currently no ecosystem-based assessment techniques for anthropogenic sound, which would allow full assessment of the Indicator criterion (“Introduction of energy, including underwater noise, is at levels that do not adversely affect the marine environment”; OSPAR, 2014). Nevertheless, frameworks have been developed (e.g. NRC, 2005; Thompson et al., 2013; BMUB, 2014; Heinis and de Jong, 2015; Maglio et al., 2015; see also the case study in Ecosystem Assessment Outlook – Developing an Approach) to assess the potential impact of anthropogenic sound on particular species, such as spatial risk-assessment approaches and population modelling. OSPAR will review whether and how such frameworks can help the assessment of impulsive sound impacts on populations and the ecosystem. Spatial risk assessment approaches include combining sound source distributions (e.g. pulse block days, or activity; Maglio et al., 2015) or modelled sound maps (based on propagation modelling) with distributions of particular species. The study of sound propagation is well established and understood at the small scale, and need not present a significant level of uncertainty if carried out according to best practice and with sufficient data (Farcas et al., 2016). Work is currently being undertaken to validate modelling of sound propagation over large distances. Taking considerations on validation into account, acoustic modelling can be used to map sound levels to better understand the exposure of marine organisms. This would require specific acoustic receptors, such as acoustically sensitive animals, and could provide greater understanding of impact (Ainslie et al., 2014; Sertlek, 2016). These approaches can also be used to map ‘hotspots’ corresponding to high levels of anthropogenic sound and high density of animals (e.g. Erbe et al., 2014). Such an approach was applied by NOAA in the CetSound project (NOAA, 2012), which mapped sound levels and cetacean distributions in US waters, and by ACCOBAMS (the Agreement on the Conservation of Cetaceans of the Black Sea, Mediterranean Sea and contiguous Atlantic area) to map risk of noise to cetaceans in the Mediterranean Sea (Maglio et al., 2015). Mapping techniques of this type can enable the inclusion of anthropogenic sound in marine spatial planning. Population modelling techniques consider how the disturbance of individual animals may ultimately affect the growth rate of a particular population, through changes in fitness and fecundity. There is currently a lack of observational data to parameterise these models, and expert opinion is instead used to inform the predictions. Several frameworks have been developed (Thompson et al., 2013; King et al., 2015), and applied to harbour seal Pusa vitulina (Thompson et al., 2013), bottlenose dolphin Tursiops truncatus (Pirotta et al., 2015a), and harbour porpoise (Ecosystem Assessment Outlook – Developing an Approach and Heinis and de Jong, 2015) populations. However, observational data are needed to corroborate the predictions of these models. This would require a detailed long-term study of a large population to detect any significant effects (Pirotta et al., 2015a). As these examples make clear, there are now several techniques available that could be adapted for use in OSPAR assessments. Future work is planned to develop further common indicators for impulsive noise that address impacts on particular species or taxonomic groups. The present indicator provides important pressure information that could be used in combination with distribution maps of acoustically sensitive species. Such assessments would enable the identification of priority areas for improved spatial planning to assess and manage the effects of noise in the marine environment. Debusschere, E., Hostens, K., Adriaens, D., Ampe, B., Botteldooren, D., De Boeck, G., De Muynck, A., Sinha, A.K., Vandendriessche, S., Van Hoorebeke, L. and Vincx, M. (2016). Acoustic stress responses in juvenile sea bass Dicentrarchus labrax induced by offshore pile driving. Environmental Pollution 208, 747-757. DeRuiter, S.L., Southall, B.L., Calambokidis, J., Zimmer, W.M., Sadykova, D., Falcone, E.A., Friedlaender, A.S., Joseph, J.E., Moretti, D., Schorr, G.S. and Thomas, L. (2013). First direct measurements of behavioural responses by Cuvier's beaked whales to mid-frequency active sonar. Biology letters 9, p.20130223. Ellison, W. T., Southall, B. L., Clark, C. W., and Frankel, A. S. 2012. A new context-based approach to assess marine mammal behavioural responses to anthropogenic sounds. Conservation Biology 26, 21–8. Erbe, C, Williams, R, Sandilands, D, & Ashe, E (2014). Identifying modeled ship noise hotspots for marine mammals of Canada's Pacific Region. PloS One 9, e89820. Farcas, A., Thompson, P. M., & Merchant, N. D. (2016). Underwater noise modelling for environmental impact assessment. Environmental Impact Assessment Review, 57, 114-122. Heinis, F. & de Jong, CAF (2015). Cumulative effects of impulsive underwater sound on marine mammals. TNO Report R10335-A. 86 pp. King, SL, Schick, RS, Donovan, C, Booth, CG, Burgman, M, Thomas, L, & Harwood, J (2015). An interim framework for assessing the population consequences of disturbance. Methods in Ecology and Evolution 6, 1150-1158. Maglio, A, Pavan, G, Castellote, M, & Frey, S (2015). Overview of the noise hotspots in the ACCOBAMS area. Final report. 45 pp. NRC (2005). Marine Mammal Populations and Ocean Noise: Determining When Noise Causes Biologically Significant Effects. National Research Council (NRC), National Academies Press, Washington, DC, USA. Pirotta, E, Harwood, J, Thompson, PM, New, L, Cheney, B, Arso, M, Hammond, PS, Donovan, C & Lusseau, D (2015a). Predicting the effects of human developments on individual dolphins to understand potential long-term population consequences. Proceedings of the Royal Society B 282, 20152109. Pirotta, E., Merchant, N.D., Thompson, P.M., Barton, T.R. and Lusseau, D. (2015b). Quantifying the effect of boat disturbance on bottlenose dolphin foraging activity. Biological Conservation 181, 82-89. Simpson, S.D., Radford, A.N., Nedelec, S.L., Ferrari, M.C., Chivers, D.P., McCormick, M.I. and Meekan, M.G. (2016). 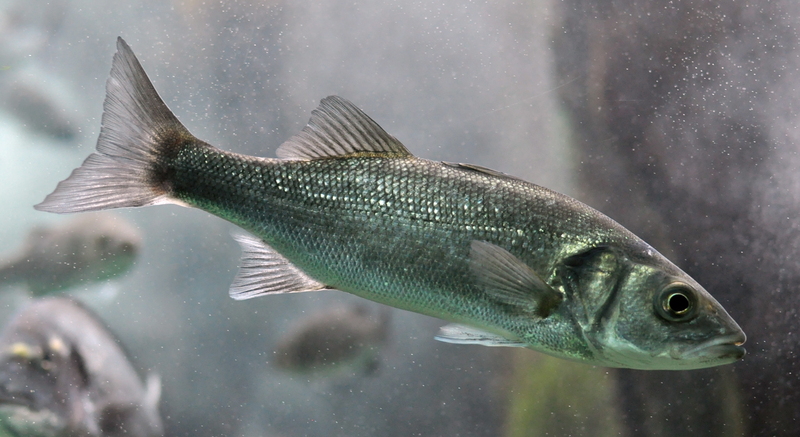 Anthropogenic noise increases fish mortality by predation. Nature communications 7. Solan, M., Hauton, C., Godbold, J.A., Wood, C.L., Leighton, T.G. and White, P. (2016). Anthropogenic sources of underwater sound can modify how sediment-dwelling invertebrates mediate ecosystem properties. Scientific reports 6. Thompson, PM, Hastie, GD, Nedwell, J, Barham, R, Brookes, KL, Cordes, LS, Bailey, H & McLean, N (2013). Framework for assessing impacts of pile-driving noise from offshore wind farm construction on a harbour seal population. Environmental Impact Assessment Review 43, 73-85. Williams, R, et al. (2015) Impacts of anthropogenic noise on marine life: Publication patterns, new discoveries, and future directions in research and management. Ocean & Coastal Management 115, 17-24. OSPAR Agreement 2014-08 Monitoring Guidance for Underwater Noise in European Seas. OSPAR Publication 2009-436 Overview of the impacts of anthropogenic underwater sound in the marine environment. Tasker, M.L., Amundin, M., Andre, M., Hawkins, A., Lang, W., Merck, T., Scholik-Schlomer, A., Teilmann, J., Thomsen, F., Werner, S. and Zakharia, M., 2010. Marine Strategy Framework Directive Task Group 11 Report Underwater noise and other forms of energy. Report No. EUR 24341. Van der Graaf, A. J., Ainslie, M. A., André, M., Brensing, K., Dalen, J., Dekeling, R. P. A., Robinson, S., Tasker, M. L., Thomsen, F., Werner, S. (2012). European Marine Strategy Framework Directive - Good Environmental Status (MSFD GES): Report of the Technical Subgroup on Underwater noise and other forms of energy. Common Indicator of the distribution of low- and mid-frequency impulsive sound sources in OSPAR Regions II and III. Partial data were reported for the year 2015.